In this feature length documentary the viewers are taken into a secret operation where a group of Finnish cave divers try to retrieve the bodies of their friends from deep inside underwater cave in Norway. Now they have to face the burden of their own fears during this life-threatening mission. It’s only mentioned very quickly in the documentary itself, but the team that recovered the two men set out just only seven weeks (~= 1.5 months) after the tragic accident happened. In the documentary you can clearly see that they are all still processing the events that happened – especially “Kai“ who was under water for about 11.5 hours in total (! ), and had to return solo thinking all his friends had died – but also that they are dedicated to bringing back their lost diving buddies. 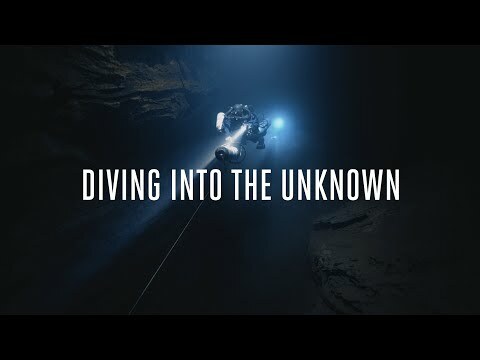 👉 FYI: If you live in Belgium you can watch “Diving into the Unknown” for free online on vrtnu, until Feb 21. Googling a bit around, I found this interactive scrollthrough infographic (pictured above) which gives you a good overview of the events that happened — something that I found missing in the documentary itself. The passage began to ascend. At one point, it makes a 90-degree turn right while continuing to ascend. It is a narrow section, but not the narrowest on the route. Grönqvist went first, but having made it through he realised the the light of Huotarinen was nowhere to be seen. He turned around and waited. 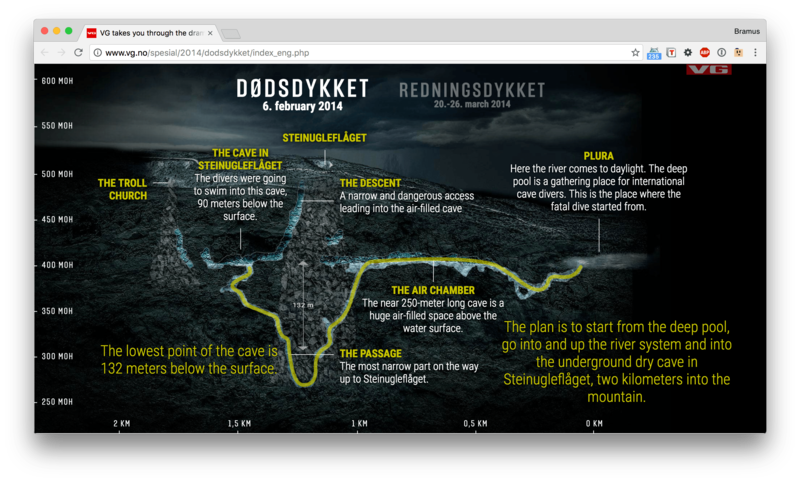 “Then I saw Jari waving his light up and down,” Grönqvist describes. That is the sign divers use to indicate distress. Grönqvist turned back. They were now positioned face to face in the narrow passage. Huotarinen asked Grönqvist to detach one of his large bailout cylinders, which was apparently in the way. It was difficult to detach. Grönqvist moved his scooter out of the way. He swam back down the narrow passage to Huotarinen and moved the bailout cylinder roughly a dozen metres ahead next to his scooter. He thought about yanking Huotarinen in case he was stuck but was concerned it could induce panic. After the scooter came off, Grönqvist moved out of the way. They were 111 metres below the surface. The longread also gives a detailed explanation on how rebreathers work, how a pause of five minutes at that depth increases your dive time by over an hour, what nitrogen narcosis is, … — recommended stuff if you’re no diver, unlike me. Ik vind het onverantwoord om dieptes van -130 meter op te zoeken, en vooral een parcours te doen, zonder eerst een paar testduiken te doen. Het is de huidige technologie die ons toelaat om dieper, langer en veiliger te duiken. Het neemt echter niet weg dat je daarom idiote duiken moet plannen. Spijtig, die twee Jari’s hebben dit zeker niet verdient, maar de geest en druk van de groep deed hen dingen doen die men normaal niet doet na enig nadenken. Plan je eigen duik, briefen, en dan pas uitvoeren na overleg van pro en contra’s.